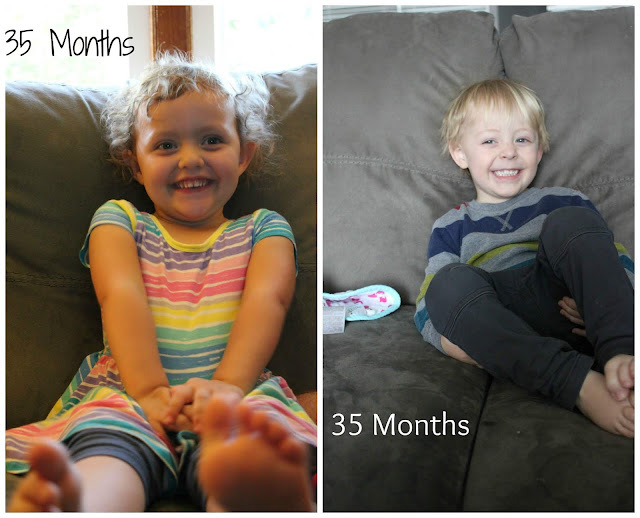 I still can't believe Connor is about to turn three! That just doesn't seem possible. But here we are anyway. I guess a lot more differences between the two of them this month than similarities. They both have adorable smiles however. I don't even know what to say. They don't really look alike to me and their personalities are pretty dang different at the same age. Addison was cautious and just starting to really talk. She was just now out of her ankle braces so her gross motor was not as far along as Connor is now. Connor is pretty fearless. He talks nonstop - sometimes about the craziest things - but he's clear and can get his point across very well. He is jumping and climbing and doing way more than I think I really want him to; he just makes me nervous sometimes. But no matter how different they look or how different they are, I love them just the same. It's just hard to believe she's now six and he's about to turn three. It just doesn't seem possible.